Douglas Dretke, executive director for the Criminal Justice Center's Correctional Management Institute of Texas (CMIT), brings a special insight to the position he officially took over July, 2006. The 26-year veteran of the Texas Department of Criminal Justice and SHSU alumnus has first-hand knowledge of the agency, one with which CMIT works closely, as well as a knowledge of the clientele's perspective on the kind of resources CMIT provides. During his tenure with TDCJ, Dretke built strong working relationships with those state and national leaders. His life-long field experience gives him insight on the issues and challenges corrections leaders are facing today. Dretke rose from the bottom of the ranks at TDCJ, starting out as a correctional officer for a year before moving up to assistant warden at both the Eastham and Hughes Units to senior warden at the Holliday and Pack Units and eventually to director for the Correctional Institutions division. 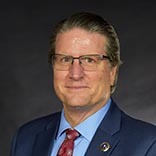 Dretke earned his bachelor's degree from SHSU in criminology and corrections in 1980 and his Master of Public Administration with a criminal justice concentration from Texas A&M - Corpus Christi in 2001. Over the years he has become a highly regarded presenter/facilitator, delivering a number of speeches nationwide on various criminal justice-related issues. Dretke's passion for leadership development fit perfectly with the CMIT mission to: Create and deliver a broad range of professional and development program and initiatives for personnel in institutional corrections agencies as well as adult and juvenile probation communities. Since 1965 when the Texas legislature established the Institute of Contemporary Corrections and the Behavioral Sciences, there has always been a strong tie between Sam Houston State University and the Texas Corrections Systems. The Correctional Management Institute of Texas was formally created under the umbrella of the Criminal Justice Center in 1994 - carrying on that collaborative tradition. CMIT's objectives are clear; it delivers high quality and relevant professional training, technical assistance and direction, as well as facilitating research and program evaluation services for juvenile and adult institutional and community corrections agencies. CMIT serves as secretariat for the National Association of Probation Executives, the Texas Probation Association, the Texas Jail Association and the Texas Association for Court Administration. It also serves as host for various conferences, training initiatives and meetings of agencies and professional organizations.